In Acts 17 we saw how a fledgling church was planted, with characters like Jason soon having to face up to opposition. They survived! Their discipleship had become established enough for the church to not only continue, but themselves to become examples to others. Here are five golden nuggets we have gleaned from this series. Few New Testament passages are as difficult as this one! Augustine, founding father of much of Western theology wrote 'I frankly confess I do not know what it means'! 'Who on earth are you?' is a rude but poignant question for each of us. Paul actually asks 'Who in heaven are you?'. Who we are in God's eyes translates into our calling and purpose in the here and now on earth. [UP] Do you recognise God's calling on your life? We've all seen victory homecoming parades, typically for a sports team - a great crowd goes out to line the streets, cheer and welcome. The sports team will doubtless end up at a banquet - in ancient Middle Eastern culture the arrival of a king or dignitary would see people venture out of their city to welcome the person, and then follow the cavalcade back in and share in the celebrations. For us it would be like lining the A10 out as far as Stretham, and then following back in to the centre of Ely! God is love! Our ability to relate comes from Him. God Himself embodies relationship: Father / Son / Holy Spirit. In our brokenness Jesus makes relationship possible - showing us God, but at the same time also showing us what it means to be truly human, i.e. in relationship. [OUT] Do you make time for relationships? God's desire is that people are restored to Him - they are drawn into the embrace of Father, Son and Holy Spirit. Yet we know in our own lives we have things that go against that, that spoil relationship with God and each other. Paul, once a follower of Jesus, became a man who worked hard and went out of his way to work alongside people, telling them about Jesus. Despite opposition and insult, he continued his work. He didn't simply try to please people, but shared his life in order to talk about Jesus. He didn't give up, but carried on so that his whole life became a story of God's grace - the ability to live life to help other people discover God. Separation naturally brings anxiety - we want to know how the other is doing. Hence Paul was concerned for the Thessalonians. Not having phones or Facebook, he dispatched Timothy to visit and report back. The news was good: v6 talks of faith and love. I.e. they were still in Christ and still proclaiming the Kingdom. [IN]: Do you love the body? Modelling and imitation is a concept seen several times in the New Testament. Hardly surprising in that Jesus set about modelling Kingdom life: gathering people around him, giving them hands on experience of the Kingdom, unpacking it for them, sending them to do the same, and then helping them make sense of it. In Acts 17 we see Paul and companions turn up in Thessalonica in the next phase of their outreach. They do the sensible thing by preaching Jesus the Messiah in the synagogue, i.e. where they are likely to find people ready to hear the good news. [UP] HOw do you live life with Jesus close by? One of the final 'chunks' of Zechariah starts at 12:1 and builds momentum, reaching v10 where God says 'and I will do this ...'. The chunk ends in 13:7 - 9 with a poem. Curiously this poem could apply to Israel before it was attacked by Babylonians, in other words pre-dating all the stuff we have looked at in Zechariah so far. The foreign attack would then be the 'striking the shepherd', and the exile the scattering of the people. [IN] How is God shaping us as a church? Today we had a multi-format learning occasion, with different resources to help us dig into Zechariah. The full pack of those resources can be found here. Whilst the first 6 chapters of Zechariah was essentially one big vision with clear date references, the following chapters are a collection of different visions and are harder to date. [UP]: How much do you appreciate that God is passionately for you? In these chapters we see God is active, working through the ordinary leaders of the day. Each week also seems like Christmas, with links to verses we read each year (e.g. Is 11:2 last week). Here we have another figure, Zerubbabel, who we find in a Christmas verse that we don't often read - Mt 1:12 genealogy of Jesus. Decades earlier the Israelite people had been taken into exile, because they had been unfaithful, they had not lived as God had required. From leadership down it had been a sorry story. Now Zechariah has a vision of a court room, where high priest Joshua is on trial with the Lord as judge. [OUT] Which neighbour is God leading you to invite? The Old Testament prophetic visions often start with an everyday object which is used to convey a much bigger message. So chapter 2 starts with a simple measuring stick. With a slightly bizarre in-vision conversation Zechariah is told the stick is to measure the city of Jerusalem. Then the point unfolds - Jerusalem will be transformed, not just to a super-size city like we have today but to something very very special. We are taught at school to write letters with our address and date at the top. Thankfully the person who wrote down Zechariah's words was taught similarly, and gave us the information that locates these words quite precisely in history to 520BC, when the Persians had control over the whole region including Israel. It had been around 70 years since Israel fell to the Babylonians - the land was in foreign control, hence the date reference of Darius, a foreign king. [IN] What might God be saying to us? Fire needs three things: fuel, oxygen and heat. Remove any one and you put the fire out, e.g. a fire blanket smothers the fire, removing the oxygen. A big question in our age is the one on suffering. Arguments for atheism often start with 'How can there be a God when there is ...'. Stephen Fry recently articulated this (see here for a good response). It is a valid question, but note how the very question affirms God as all powerful, even as loving. Where the questions fall short is that they assume God remains remote and detached, looking only for God to remotely waive a wand to fix things. Theologians have wrestled with this, especially in the light of the world wars of the last century. German theologian Jürgen Moltmann reflected on Auschwitz and wrote in the 70s 'The Crucified God'. The answer lies in the cross, where God in his perfection becomes the one with all the badness of mankind loaded onto him (2 Cor 5:21). This happens in the reality of Roman torture and execution. This is God experiencing suffering directly. In our first instalment we saw how God presented Christ on the cross - like a son willingly carrying out a father's assignment. In fact Moltmann asserts that Father, Son and Holy Spirit all participate and suffer through the episode of the cross: the Father has to watch, as if helpless, while the Son physically suffers. The Spirit is active, preparing and leading the Son to this crucial event in history. Note the Bible does not directly give us data on the suffering of Father and Spirit, but we know that suffering always extends across relationships: witness the weekly scenes on our TV news of parents' grief over a son/daughter tragically killed or murdered. With God as three persons in relationship, maybe Moltmann was right. This idea simply does not work in the other great religions, which describe God as all-powerful and therefore never vulnerable. The Muslim's holy book therefore even tries to directly refute the death of Jesus (regarded as a prophet). Yet for the Christian it becomes the only way that actually makes sense. Christ taking on our human badness, deals with the brokenness of world. It is as if Jesus on the cross is able to hoover up all that which is bad in the world. Our badness is put on him, and dealt with (see Is 53:4 - 6). It is a cosmic hoover, because it is actually capable of removing everything through all history (both before the actual event and ever since). The benefits are immediate: in that snippet from Luke where one criminal cries out to Jesus, Jesus replies 'Today you will be with me in paradise'. Jesus on the cross has a transforming effect, enabling people to move on and forward. If we want to understand God therefore, let us not start with assumed superlatives (e.g. 'all powerful') and then made deductions. Instead let us look to Jesus, and Jesus on the cross. Faced with ill effects blighting lives, let us pray by putting the cross between the person and the issue - looking at the issue through the cross. The call on us is to follow, to be ever closer to Jesus. Thats the scary bit, since to be close to Him will mean being closer to the cross, following his way of a life laid down. This way does not need great cleverness, nor strength, swords or missiles. It is the way that will change the world, hoovering up the bad so people can be transformed and move forwards. In our first look we considered big words that can be understood in legal terms. Using those terms alone risks understanding God only as some keeper of an abstract law, reducing life only to a question of right or wrong. [UP] How much can you say “I am a friend of God”? In Romans 3:25 Paul uses some tricky and complicated language, talking of Jesus Christ being presented as a 'sacrifice of atonement' (as translated in the NIV). The actual Greek might also be translated as 'place of atonement'. 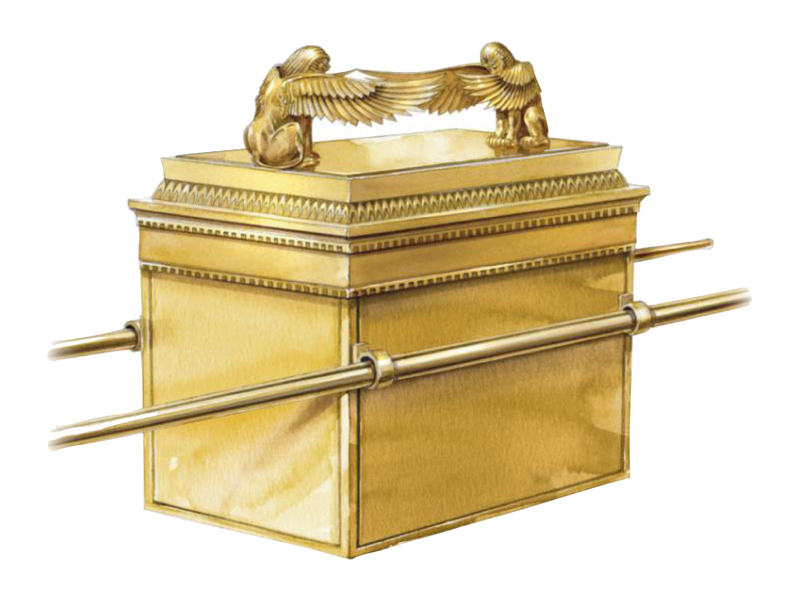 Furthermore the Greek wording is recognised by scholars to refer to the 'atonement cover' of the 'ark of the covenant'. The box was carried and kept by the wandering Israelites as their most hallowed and treasured possession. It would be placed at the very centre of the temple, ultimately representing the place where people could meet with God and be made right once again. So make no mistake, it was an important box! Jesus dying on the cross is the atonement cover! Yes Jesus-on-the-cross replaces the box. The actual physical box was somehow lost in history anyway, but Jesus being raised to life is very much alive today and so continues to be that ultimate place where people can meet with God and be made right once again. - the status God gives us as a free gift, of being right or innocent once again. Put on the right side of the right/wrong line. In this new series we ask how 3 nails, 2 pieces of wood and a man changes the world and achieves God's victory. Looking at the cross from different angles, and considering the various big words the early Christians use. This may provoke questions in you - so feel free to post them as comments on these posts. Armies tend to disciplined: when the war is over and the order is given for fighting to stop, then the guns fall silent. Yet that is not the case in the conflict with the forces of evil. The victory was won in Christ's death and resurrection a long time ago ... but its as if the message hasn't got through to the other side! The enemy goes on attacking, prolonging the struggle, even causing casualties. [OUT] Where are you called to make known the good news? Challenge: Ask God for the armour … that you may proclaim fearlessly! Download by clicking here the teaching resource pack used with this week's message. From Paul's 'urging' in v1 he now notches up to 'insisting' in v17. Each of us is put off the old self and live our new lives in Christ, which is unpacked in various ways through this whole section. In many ways it repeats the 'New Life, New Life-Style' series we saw in 1 and 2 Corinthians last year. Paul will not tolerate any of us living a double-life - we are to leave our non-Christ-like behaviour behind. Half-way through the letter we realise that chapters 1 - 3 are all about God, and 4 - 6 are about our response. Kind of 'because God is ... I urge you to respond thus ...'. Verse 2 briefly says to do it with good character, and verse 3 calls for us to make every effort. Is God distant or close? For many it perhaps suits them for God to be distant. Certainly the traders in Acts 19 liked it that way, since they filled the gap with their religious paraphernalia that kept them in business. Yet from Ephesians 3 it is clear to see that God wants to reveal, to be made known, to be seen by all. [IN] What is God revealing to you … for others? Groups or even whole nations easily get into hostility with each other. In Paul's time there was the religious divide of Jew and Gentile ... with a wall of hostility between them. The fact is both sides also have a barrier between themselves with God ... and life without God leaves us open to develop hatred of one another. This year we start a new series called 'Understanding God'. First using Ephesians to rehearse some 'core theology' (i.e. 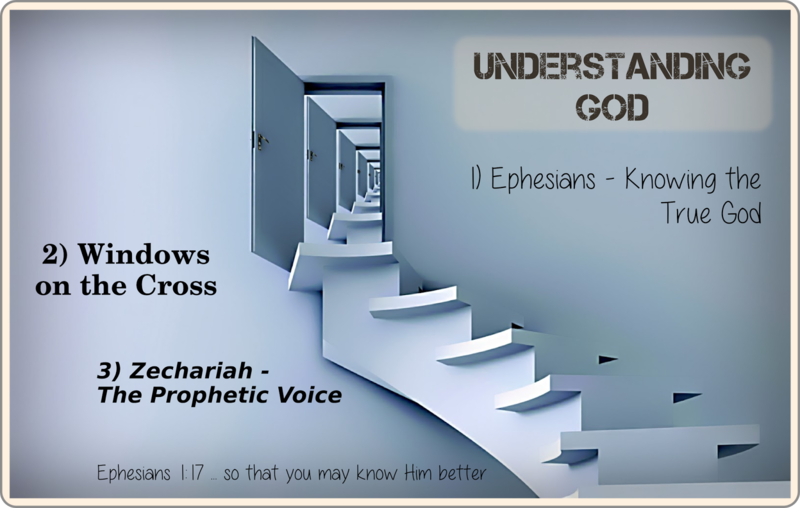 how we understand God), we will then spend some time looking at the cross through different windows, before using Zechariah to see God speaking into the life of the people past and present. [UP] Do you know God's calling on your life?